With this release we are bringing you some hot and new improvements which are much needed in this cold season! Now you are finally able to experience all of our convenient coalition features in team games as well, including a shared chat for all team members. We even added some additional features to make playing in teams or coalitions a better experience. We also fulfilled another big request: You can now use the handy Event log in the PC version of Call of War. In it you can see a list of what happened in your game round, even while you were offline! But that is not all, we released even more improvements, including a graphics update in the WebGL renderer, new loading screens and a new language option in the mobile version, as well as many bug fixes. Be sure to check out the detailed summary of all features and fixes below! Implemented awesome new loading screen layout and pictures. Finally! Province names are now displayed again for all provinces in the WebGL renderer (you may need to toggle them on in the game settings). Implemented 3D relief for map terrain in WebGL renderer for more immersion. Improved color palette of the morale view option in the WebGL renderer. Look at this lush green map! Implemented the ingame event log in the PC version, which lists all events, including those that happen while players are not online. Upcoming and current Event maps are now advertised at the top of the main website in the PC version, including a timer which shows the sign-up period. Click on the new event tiles to get more details on each event, as event details will no longer be posted in the general news. Brand new event maps are coming very soon! Players can now switch their language in the settings menu in the mobile app of Call of War. Players now drop out of games within 10 minutes instead of 60 minutes when not choosing a country, to prevent blocking game starts for too long. Added line breaks for long button texts in the mobile interface to make them readable. Added support button on the website in the mobile version so that mobile users can write tickets outside of their game rounds. Added a flag and info popup for beta games (frontline pioneer games) to make it more clear that these are test games. Improved unit positioning and selection in WebGL renderer. There was a common issue where players could seemingly buy something from the stock market but did not receive the resources. 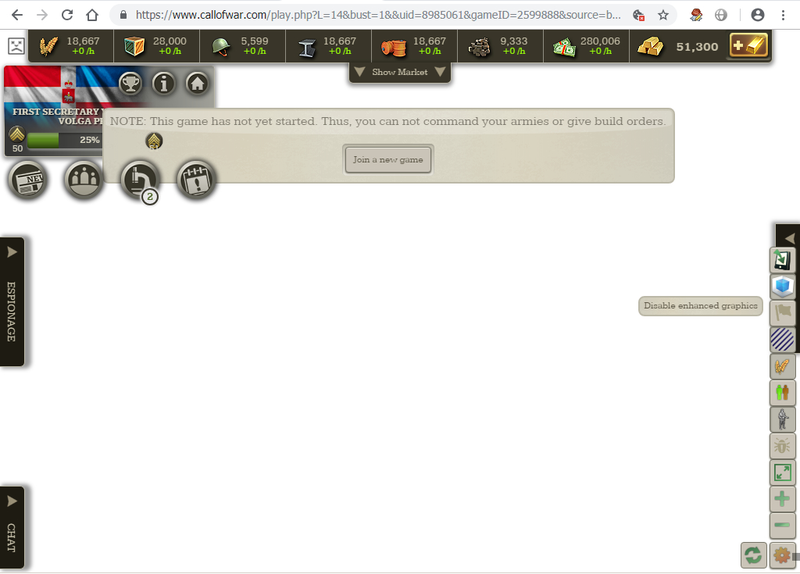 This could happen when someone else bought the offer faster than the player, before the market interface was refreshed. In that case the money was deducted by a “buy offer” which was placed in the market instead of buying the resource. The market now refreshes much more often to prevent this issue. Fixed a case where push notifications could not be sent in the iOS version. Players of anonymous rounds are no longer revealed in push notification texts. Fixed incorrect timestamps in the event log on speed maps or when speeding up constructions. Research times are now displayed correctly again on speed maps in the mobile version. Trade offers are now using the correct real timestamp instead of the ingame time in Speed maps. Fixed an issue for some players where the toggle option for the WebGL renderer was not visible in the game settings. Since this was a big release, there can be some hiccups, which will be fixed swiftly afterwards. We hope you all like the changes in this huge update! Tell us your favourite part in the forum comments! Thanks for the update. It looks much better now. Especially I liked not having invisible units anymore. But one more question. Are you going to count previously won team games, add the gold reward and victory in the stats? Looks like a good update. Great job bytro! To build, you must first destroy. ...this webGL thing just won't run well! Do I have to change something in my setting? Does someone have tips, tricks or whatever for me to make it run well? Or does the webGL simply require a new computer??? Which I think we'll all agree will be horribly boring. No it doesn't, we optimized it so that it even runs on older computers (if it is too old we can't do anything though). On yours it should work like a charm. Open your nvidia control panel and tell your graphics card that your browser (Firefox or Chrome) shall be opened with your Geforce graphics card. The default setting is that browsers are opened with the onboard graphics card of the i7. Update your graphics card driver. This is very recommended also for older systems and usually fix the issues. Make sure that you don't have too many tabs at the same time open, or other resource hungry applications. Maybe try it once in another browser with only one game tab open and no other programs opened, to rule out causes. Ehhm... is this one really an improvement? To me this restriction always seemed to make a lot of sense. Certainly we'll now often see only one team filling up with human players(? )Which I think we'll all agree will be horribly boring. The problem with it was that it made it a huge hassle to join a team game together with a friend, because they were forced to play in different teams or had to wait a certain timeframe until the other teams also got new participants. Also a hassle for community rounds or tournaments using the team setting. On active servers where games fill up anyway this shouldn't create any problem, as it doesnt matter in which order they fill up. I can see though that it may result in balancing issues on less active servers where games don't fill up. Have to think about solutions for that. But if users think like you and agree that it's boring filling only 1 team, people interested in such games will hopefully naturally balance it out themselves, as they want to have fun. Nice looking update. I complained about the webGL colors and graphics when it came out. This looks much better and wanted to say thanks to the staff. WebGL doesn't work at old videocards (white screen instead of map). Depends on how old it is. Very old probably doesnt work, somewhat old should still work in many cases. Please try installing your latest graphics driver, this could be just a software issue. Many old systems often didn't upgrade drivers for a long time. Doing so could fix the problem already. Not driver problem, very old videocards whithout drivers support. This problem was solved in "Supremacy 1914" for any videocards (from 2004 year prodaction). Anyway this game must be work at all comps with WebGL-support browser. The post was edited 1 time, last by war-play ( Jan 25th 2019, 3:14pm ). Still please make sure that the latest available driver is installed, even if the driver is also very old (but newer than your installed driver). You can also try to use a different browser, just to rule out potential causes. If that does not work, please write a bug ticket (bottom right corner of your game) and send in your complete computer specs, it may be useful to us to further tweak WebGL. Though you may have to switch to non-WebGL graphics unfortunately or get newer hardware. and last version (71.0.3578.98) of Google Ghrome with WebGL-support. Anyway I like old graphics and I ask you to save it. The problem with it was that it made it a huge hassle to join a team game together with a friend, because they were forced to play in different teams or had to wait a certain timeframe until the other teams also got new participants. [...] But if users think like you and agree that it's boring filling only 1 team, people interested in such games will hopefully naturally balance it out themselves, as they want to have fun. I hope so, too. But am very sceptical. Most folks like to have an interesting, balanced game, but wouldn't give away an own advantage just for the sake of that. And to be honest, I also wouldn't join the smaller team if I see the other one has already three or four human players more - because that would be a bit too tough. How about putting the restriction back in, but now to allow a difference of two players in the team sizes. So if two friends want to be in the same team, they can do so. If 4 friends want to do a team match, they can play with two friends in one team against two friends in the other team - which should also be attractive for most. Only in case three friends want to be in the same team, one of them would have to wait joining until the opposite team got an additional member. Blah Blah Blah...Love that the all things are great for the phone and /phone puppets. I know without these you can't bring in new gold buyers or set up for something else.... What I want is to not have the frakin event screen pop up! I've enough problems killing all these puppets to get pissed about that. I'm noticing that the coalition list is now scrollable on the mobile version - thank you! Web GL still very sluggish on my old-ish tablet (Samsung Tab A) but turn it off and its fine. Overall update is looking really nice. Good job Bytro! I'm not trying to only target you, Shodanar, but for the last time, please do not rant about things without giving a decent explanation. I apologize for being so harsh, but I have never seen you giving one constructive criticism that allows the devs to improve on problems that you may see. Also, please do not apply your own stereotypes into this. I definitely do not agree you just categorized all people who use their phones to play this awesome game into the golder category. Please shut up until you have improved in your manners. I am absolutely fed up with your rude and useless feedback. I am very sorry for also being so rude. I wanted to give my point out, so I will pre-apologize for anyone who thinks I've gone too far.